Can’t believe how the week has flown! Work was good, given I only had to work three days. 🙂 But in those three days, I got a grant written and submitted; an extension request completed, worked with the grant writer at another agency as she wrote a huge federal grant for a group of us; went to a board meeting and a development committee meeting (minute taker); reviewed a funding request my boss was working on; and met with my boss about future projects. SO yes, I am ready for it to be Friday!!! I do feel a good sense of accomplishment though. It will feel even better if some of these get funded. I think you get the drift. I have to do a lot of knitting, because Saturday is the start of the CAL I am participating in – CANNOT WAIT! -but I should make some progress on my little scarf I am working on before I lay it aside for a while. I love it – it is more of that wool/silk blend I used for the last one, and it is in linen stitch, which is new to me. But here’s the thing. It takes rows and rows and rows to make headway. I started it on size two needles, and realized it took me several hours to knit an INCH. I ripped it out and recast on using size seven needles. The fabric drapes much more nicely now, but it still takes a lot of rows to make a little progress, because so much ease is used up in the slipped stitches. I also have to confess it is slow knitting, it takes concentration to not do k1p1, when you are putting the yarn there, and slipping the stitch. Far too easy to just go ahead and purl the darned thing. I can see that once or twice, way back, I did that. Here’s hoping no-one notices, because I am not pulling it out again. 🙂 I think this will be a long-term project. At least, it is small and light and can be my mobile project until it is done. Which will mean no hats for a while. But once I finish the CAL, then I can go back to every other thing I knit is a hat. The give away bag is nearly full, I would like to get it full and delivered before too late in the summer, so they are ready to give out on the first cold day. Which we aren’t even going to think about right now, it is nice and warm today, and tomorrow is supposed to be NINETY! I am so glad that the pool is ready and waiting for me, even if I do need to scoop the tree bits out of it. Yes, it should be a good day! Author salpal1Posted on May 30, 2013 Categories how I plan to spend my day, what I am making, what I am thinking about makingTags cash mob, errands, Friday, knit, long week at work, pinestar studio, pool, to-do list, WIP, yarnLeave a comment on Friday list already! That’s a stumper. Truthfully, I don’t really know that you all do care – yet I seem to be getting followers and likes. I tried to explain the community of bloggers, of knitters, of crafters, of writers. I failed miserably. I did tell her how amazed I am to have so many international followers, she still didn’t get it. So, why do you follow me? What is it about what I am up to today that makes you keep reading?? When we got back, we had a message from sister-in-law L that she was on her way over to plant her 4 foot raised bed. So I planted the last of my seeds with her, and then we dug some day lilies out of the overgrown bank and moved them to what will someday be the front garden. Then we let A make us some delicious burgers for lunch, before L headed out. A spent the time we were out doors cleaning up her work space in the basement, and entertaining the cats. She reports that the mama phoebe is sitting on the nest – so I suspect there are eggs now! The cats are annoyed to not be allowed on their little deck, but that’s OK with me. The hummingbirds are active, there is a pair who are feeding hungrily, they must have just arrived. That makes two pairs here so far, we will see how many we get now. I have a lot more flowers around this year. Lots of buds on the red rose, and the wild roses are really spreading out this year, finally. Can’t wait to see how they look all covered with blossoms in a few weeks. The asparagus is all up and leafing out, I hope this experiment works,a nd we get some to eat in a few years – meanwhile I interplanted it with cosmos to make the pool look less of an eyesore. I scooped the pool from the outside today – it is FULL, but very chilly, so I didn’t; feel like getting into it. I will eventually, don’t you worry. Next weekend look pretty busy, but if Friday is nice, I might get into it then. I finished a lightweight scarf in a heather purple wool/silk blend, which I will send off to the lucky person who responded to my Pay It Forward post quite a while ago – I might remember to take a photo of it before I send it off. As only one person entered that contest, I think Crimson Crow at aml8aml8 might be able to figure out it is for her. 🙂 Now I am working on a light blue scarf in lace weight alpaca/silk blend using a linen stitch. I might keep this one. Thanks so much with your help filling the last few inches of the pool. It looks great, so you can stop now. Well, it’s a good one, let me tell you! LYS – got a call that the yarn for the CAL is IN! can’t wait to get it and see how I did choosing colors. the big box craft/sewing stores in search of buttons for that blue/green cowl I made a while ago – still looking for the right ones. Pick A up from work, when she gets out early! have dinner out in a place we haven’t tried yet – a pub in the downtown area – I will let you know how it goes. knit (if it is on the list, I have permission to do a lot of it, right?) I am working on an interesting scarf, can’t remember if I have told you about it – diagonal triangles worked with short rows so no sewing. I am using some yarn I got last year at Maine Fiber frolic – a heathery purple lace weight from Pine Star Studio, in a wool/silk blend. It is elegant. And here’s a few things I have already accomplished, so no need to put them on the to do list, but rather the done list! finished the award-winning post – it is amazing to me how long it takes to answer questions and facts and check url addresses! But it is done,a nd I hope you all enjoyed it. watched the last of the Downton Abbey recordings. All three seasons in about 6 weeks. I had to do it to see what all the uproar was about at the end of season 3. Now I know, and I am heartbroken. Author salpal1Posted on May 24, 2013 Categories how I plan to spend my dayTags Bangor, birthday shopping, chores, crafts, Downton Abbey, knit, laundry, LYS, post, to-do list, WIP, yarnLeave a comment on Friday list! 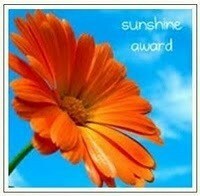 Several days ago, I was nominated for a Sunshine Award, from TamrahJo at the Good, Bad and Ludicrous (http://ballybin.wordpress.com) She nominated me because I brighten her day – which feels very nice indeed! Then, before I could respond to that, Claire at Mollie and Claire (http://mollieandclaire.wordpress.com) nominated me for my second Liebster award. 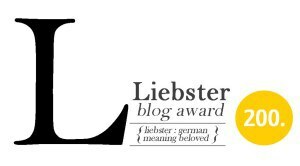 The Liebster Award is given by bloggers, to bloggers, and it’s purpose is to highlight blogs with under 200 followers that deserve a look. The Sunshine Award rules – answer the questions (below) and nominate 13 blogs which do the same for me. Favorite Animal: it’s a tie – cats and dogs. I was raised with dogs, but as an adult have learned the pleasure of cats, especially as pets for people who work long strange hours! Facebook or Twitter: Facebook, I guess, as I don’t tweet, but I much prefer WordPress. Passions: buying locally – either locally produced items, or at the least, items from a locally owned business. Crafts of any kind. Giving or Receiving: they both have their wonderful moments. Giving or receiving the perfect gift, chosen with care for the recipient by the giver, is a great feeling. Favorite City: Don’t really like them, thanks! But if I had to choose from the whole wide world, I guess it would be a toss-up between Salzburg Austria, Edinburgh Scotland, and Portland Maine (USA). To me they all share a feeling of being interesting, with great shopping and great food (well, perhaps not Edinburgh on that last) and not being overwhelming or scary, but rather fun and interesting. They all have their own personality, and it is not overwhelming to this introverted country girl. Favorite TV show: Probably NCIS… but there are others I also like… recently discovered Downton Abbey, and am enjoying getting caught up on it. 2 if you read here, you know this one – I got married on Sunday!! woo hoo! 6 love anything to do in or on the water, except, of course, drowning. 8 I’m an optimist – I buy lottery tickets every week. 1. What is your favourite time of the day and why? Morning, because everything is fresh and new and I am rested. 2. When do you write your blog posts? I try to always do my Friday list Thursday night or Friday morning, but the rest of the posts are somewhat random – when I have time or something is niggling at my brain. Probably most of those are written in the evening or on Sunday. 3. How important is your blog to you? Hmmm. I would say it is of medium importance. I try to do a good job posting and remembering to take photos, but I don’t obsess about it – as evidenced by a lack of posts in recent days! But I have to confess, I love checking my stats and seeing where everyone is. Amazingly, I have lots of readers in the UK. I wonder how that happened. 4. Where have you been that you would really recommend people to visit? Hmmm…. lots of places, but I would have to preface this with these people should be introverts who like a nice quiet time. And a boat ride. 🙂 I loved the Isles of Skye and Mull in Scotland, Block Island (Rhode Island, USA) is near and dear to my heart, and my recent island love is Monhegan (Maine, USA) These places are beautiful, wild places with real people living there. 6. What is the best gig you’ve ever been to? Every time I see Cheryl Wheeler live is the best gig yet. 7. Recycling or Upcycling? I like upcycling, but in practice, I more often recycle. 8. Who is your favourite knitwear designer? Oh heavens. Not sure I know them well enough to be able to answer this. I like items that are a challenge to my skills, like Estonian Lace (I have Nancy Bush’s book on the subject) but I also like simple patterns that I can alter easily to make them unique. There is an old Candide neck down sweater pattern that I have surely made over a dozen times, no two alike. So no particular designer, I guess. 9. What is your favourite yarn? oh, easy – I have 2 – any good silk/alpaca lace weight yarn. I drool over the colors of this that Pine Star Studio does (www.pinestarstudio.com). But I also dearly love Lamb’s Pride from Brown Sheep in Mitchell Nebraska for its smooth hand and warm fabric. 10. If you had to recommend an unusual yarn to yarn fans, what would you chose and why? Unusual??? Not sure I have ever used any that are. I would recommend any locally grown, spun, dyed yarn that is available to you, because I think it is important to support small local businesses where ever you are, to help keep your community vibrant. 11. If you could do anything right now, what would it be? It would be to stop the rain that is pouring down on us for the 5th day in a row, and then, when the sun was shining and things had dried off, I would hop in a sail boat with my wife, and head out to explore the coast of New England and the Canadian Maritimes. The weather would remain perfect, with steady breezes and sunshine. Claire, these were good questions! 1 in one sentence, why do you blog? 3 who or what inspires you in your life? 7 best vacation spot ever? 8 what do you want to be remembered for? 9 what made your best boss ever your best boss? 10 preferred way to spend a Sunday afternoon? 11 If you won a million, what would you do differently? 1 http://www.shemakeshats.com – Robyn is the one that started it all for me – blogging, knitting hats to keep and give away, minimalism. Worth checking out! 13 a repeat worth mentioning because she is so amazing – Jordana at my meandering trail (www.mymeanderingtrail.com) She set a major life goal, took the steps to make it happen and is even as I type is out thru-hiking the Appalachian trail – WOW! And of course, she has over 1000 followers, so again, Sunshine here, not Liebster. I confess I have not notified them all, but I am working on it. I can’t access all blogs when at home – go figure! So some will have to wait until I return to work next week. I’ll stay late just to notify! So there you have it – awards accepted and passed on. Thank you, TamrahJo and Claire! Author salpal1Posted on May 24, 2013 Categories how it came out, what I am thinking aboutTags islands, liebster award, so many facts and answers, Sunshine award6 Comments on Awards! It’s official – we are LEGALLY married. Yesterday at 11:08, Mom completed the ceremony making us wife and wife. Woo hoo! It was really simple and quiet – about 19 family members gathered on our deck, the sun was shining, the breeze was blowing, the hummingbirds were enthralled by my red shirt. Mom did a great job tying the knot, and only got choked up a couple of times. Afterwards, we went out for burgers. seafood, whatever – take out, and we all got to visit. Lots of low-key fun. We really appreciate the family (Dad and step mom, aunt and uncle) who drove all the way up from Connecticut, and the family who made time in their busy schedules to be here for us on short notice – a step dad, three sisters, two brothers and a brother-in-law, a cousin, two nieces, a nephew-in-law and a great-niece and nephew – wow! And for our own “reverend mother” who performed the service. And for the rest of the family who had previous commitments, or who are just too far away – we understand completely, but we missed you all the same. It was the planned one, of course! 2 more days, and NOW we are getting stressed! This week has been absolutely wild, unless all you wanted to do was go to work. A was traveling 5 days, overnight Monday night. She was home fewer than 8 hours a day Tuesday, Wednesday and Thursday, and worked 8 hours by noon today. Needless to say, she is exhausted. I was home MOnday and Tuesday, left early Wednesday for the New England Community Action Conference in Portland (which was GREAT, invigorating) and got home around 3 this afternoon. So, while the yard is neat and tidy, the house is a complete disaster. We decided to “just” do laundry today (we probably have 6 loads, since neither of us was home this week to do any), and rest up to be in a cleaning frenzy tomorrow. Then it will be Day Zero. Can’t wait! How nice it will be to be married and have that gold band on our fingers. And have a clean house, a tidy yard and a day off. But before that, we have to reconnect with each other. the cats, and our real lives. Author salpal1Posted on May 17, 2013 May 17, 2013 Categories how I plan to spend my day, how I spent my dayTags long week at work, new england community action conference, Portland Maine, travel, wedding prep2 Comments on 2 more days, and NOW we are getting stressed!